Thinking about adding a patio, wall, or walkway to your landscape? Whatever your hardscaping needs may be, brick masonry can be a great way to accomplish your goals for a beautiful, functional, and long-lasting landscape design. And we’ve got the experience and skill you can rely on to get the job done right, on time, and within your budget! Let us help you build that stone patio, fireplace, or outdoor kitchen you’ve always wanted with our brick masonry services in Northern Virginia. Call us at 703-533-5001 to schedule a consultation today! Brick masonry is often considered one of the most effective methods of building hardscapes, like patios and driveways, and has become increasingly popular for homeowners like you. But what makes it such an appealing choice in landscape design? From saving you money with reductions to insurance to offering long-lasting durability and natural beauty, the advantages of brick masonry seem endless! To learn more, just ask one of our experienced landscapers during your consultation. 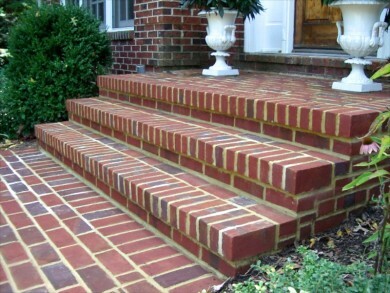 Brick masonry has become especially popular in construction, landscaping, and hardscaping projects from Great Falls to Vienna and other parts of Northern Virginia. And with brick’s durable qualities and naturally charming look, it’s easy to see why. If you’re ready to get started with the construction process or still need help deciding if this is a good fit to meet your needs, we’ve got you covered. And if masonry sounds appealing but you’re not sold on brick, we also offer stone masonry services for your convenience. We can even help you make a decision if you need a little extra guidance. So what are you waiting for? Call us today at 703-533-5001 to schedule a consultation for brick masonry in Great Falls, McLean, Vienna, North Arlington, or the City of Falls Church!